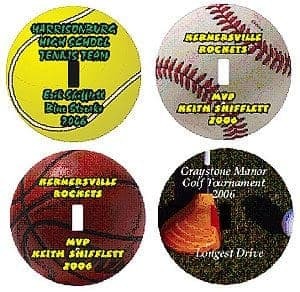 Light switch plates are an overlooked sales opportunity for full-color personalization. They add color, fun, and reminders of recognition, achievement, and participation in clubs and activities to any place that needs an imaginative addition. They are sublimatable one side, sized 5” round x 1/8” thick with cool looking black edges. Holes are pre-drilled and cases are packed with screws. Qty18/case – Broken cases billed as each. * Remove the protective plastic covering from the product. * Cover imprintable with a sheet of plain white paper. * If you are using an item that can be printed on both sides, allow the imprintable to cool to room temperature before pressing the 2nd side.